Numerous new therapies for multiple sclerosis are considered based on theories as to the causes and based on animal research. Those that appear promising are typically tested in a series of tests. These are: phase I, which looks primarily at safety and, at least a hint of efficacy. If the phase I is successful, a somewhat larger phase II trial is carried out. Phase II is to get enough safety and efficacy data to plane one or more phase III trials to demonstrate the effectiveness of the drug. The phase II trial does not necessarily have to show a statistically significant effect but will provide the evidence to plan definitive trials. These are typically quite large and the FDA generally requires two successful phase III trials to approve the drug. If significant risks are seen or suggested by the trials, the FDA may mandate a “risk evaluation and mitigation strategy” or REMS program which mandates careful monitoring, evaluation and reporting of all significant side effects. Most, though not all, of the most effective drugs had REMS programs. In the past, the FDA demanded placebo controlled trials, that is, all trials had to have a sham treatment arm for comparison with the drug being tested. Now, most new drugs are tested against another established drug, most commonly one of the interferons or glatiramer acetate. These comparison trials are of two types, Non-inferiority trials which are used to show that the drug is as good as an existing drug. This was done to gain approval of a generic glatiramer acetate. Superiority trials are used to show that a new drug is better than one of the existing treatments as was done with the testing of alemtuzumab (Lemtrada). Throughout the history of MS, new treatments have been reported based on very limited evidence and with no good rationale. These are a significant problem as they cause diversion of a great deal of effort and resources to disproving the false claims of efficacy. One of the most recent was the claim that venous obstruction (CCSVI) was causing the disease and venous stenting was an effective treatment. A number of surgeons were doing the procedure and many patients paid as much as $8,000.00 to get the stenting. It has been shown not to be effective and a great deal of expense and effort that could have been better spent on other research was diverted to disprove the false claims. Over the years claims have been made for a host of supposed treatments including such things as cows colostrum, royal jelly, bee stings, snake venom, amalgam fillings etc. At one time a list of all treatments suggested to be effective for MS was made and came to 7 pages single spaced just to list them. Many of these will appear from time to time on the internet. You should be wary of claims for efficacy based on limited, uncontrolled data. I have not dealt much with medications for MS in this blog but plan to do so in the near future; however, the approval of Ocrevus requires comment. In the authors opinion, this is the biggest advance in therapy since the first interferon was approved in 1993. This is a block buster drug. It is an infusion with two initial infusions followed by one every 6 months. Its effectiveness is up there with natalizumab (Tysabri), daclizumab (Zinbryta) and alendronate (Lemtrada) but without many of the risks. It is not free of risk, very few drugs are but it has much less risk than other drugs that are this effective. There are two cases of progressive multifocal leukoencephalopathy (PML) but this is and will be a rare event. It occurred in someone who had been on natalizumab (Tysabri) and we don’t yet have background information on the other patient. It remains likely that it will continue to be a rare event. Ocrelizumab also has been approved for primary progressive MS, the first drug approved for that purpose. Some of the other drugs should have been approved (for example beta interferons have a similar effect in progressive MS but because, like ocrelizumab, it did not improve walking it was not approved as it didn’t change the Kurtzke score which at that level is entirely dependent on walking. It did improve hand function as shown by the 9-hole peg test and cognition as shown on the paced auditory serial addition test (PASAT) but at that time the FDA only accepted the Kurtzke scale and wouldn’t accept any drug that didn’t improve disease progression on that scale. It has advanced and will now accept at least one other measure, the MS Functional Composite scale. This blog is intended to help you and those about you to understand the effects of MS on you or your loved one. Things like fatigue which has many causes in MS, why your legs quit on you after a half block, why your vision gets worse when you exercise, how MS medicines work. If you have questions we will try to answer them as best we can. This is being developed as a resource to help those who want to understand the disease. 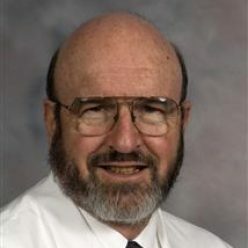 The author has spent his life since 1958 devoted to research and care of those with MS. There are some clear racial and gender differences in the behavior of multiple sclerosis which are important in management and in prognosis. At the American Academy of Neurology meeting in April of 2016, Dr. Annette Langer-Gould presented evidence that vitamin D levels which are very important in both the risk of developing MS and in its severity in Caucasians, did not apply to Americans of African origin. The effect of ultra violet light is important in converting vitamin D precursors into the active form of the vitamin. Despite this lack of correlation with vitamin D, the risk did correlate with ultraviolet (sun) exposure. The reason for this is not known. I hypothesize that it relates to two other risk factors for MS. First, obesity which is a known risk factor for MS. People who work outdoors are rarely obese. Think construction workers, farm workers and those who work on landscape. These people are generally well built but rarely obese. The second factor is sodium. People who work outside sweat a lot and lose sodium in the process. Serum sodium level is another known risk factor for MS. At least in the South Eastern U.S., the diet is generally high in sodium. This was necessary 60 years ago when a large part of the black population worked in the fields but diet has changed relatively little with the urbanization that has occurred with the introduction of machines to do what used to be done by hand. Thus, sodium levels are higher in those who work inside in more sedentary occupations than they are in those who work outside. This may explain much of the increase in MS that has occurred in the Southern U.S. over the past 50 years. Multiple sclerosis, on average is much more severe in people of African origin than in Caucasians. This is particularly true in the black male population where disability appears to progress much more rapidly. Part of the problem has been the lack of response to interferons which was the mainstay of MS treatment until quite recently. We have suspected now for several years that the interferons don’t work well in the black population and this was confirmed by the work reported by Dr. Langer-Gould. Fortunately we now have multiple treatment options. Asians with MS are more likely to have what is known as optico-spinal MS. Some of these cases turned out to be neuromyelitis optica (NMO) but many are MS and the optico-spinal form is more aggressive than the usual relapsing remitting MS. I am not aware of any reported differences in response to MS drugs in this population. It has been difficult to get clinical trial data broken down by race. Bayer did a very large trial comparing Betaseron®, double dose Betaseron® and Copaxone® but we have not been able to get a breakdown by race. With the newer medications we are not aware of racial differences in their effectiveness. It seems clear that natalizumab (Tysabri®) is effective regardless of race. Experience with the other newer medications is too limited to know if there are significant differences in the response. There is a large international consortium doing extensive genetic work on MS looking at risk factors and factors that affect severity. I expect that they will find a number of genetic factors that relate to disease severity as well as basic disease risk and, eventually, i expect we will be able to tailor treatment based on genetic factors. Memory problems are very common in MS. The most common problem and usually the most problematic is rote memory. This is memory based on repetition. It often refers to isolated facts, that is, facts with no necessary logical connection to other facts, like a date or like an address of someone you just met. It doesn’t automatically connect to other facts. This known as “rote memory”. Rote memory items are more difficult to learn than items that relate, more or less logically to existing systems. Learning facts that attach logically to other facts or to a system of facts is much easier. The brain has what I would call a random access memory which means that a fact that logically connects to multiple other facts is much easier to recall than isolated facts. In many occupations, there is a logically connected series of things that you do which I will call a “framework”. You can connect to the framework with information that logically connects to it so that, for the new connected items, recall is relatively easily because of the logical connections. Even for people with a good memory, disconnected facts and facts out of context can be a problem. A personal example is my difficulty remembering names. As an intern, if you gave me one unique bit of information from a medical history, I could connect it and give you an essentially complete history but if you gave me the person’s name in isolation, I couldn’t connect it to the history. Another way to think of human memory is how easy it is to recall your mother. You have thousands of ways to access her memory. On the other hand, it may be very difficult to recall someone you just met casually last week. Memory experts will tell you that you have to make multiple connections to remember people’s names such as she wore a dress like one I have seen on my friend Mary and a scarf I used to have and her eyes look just like Jessica’s. Now you have a few connections and the more you have the easier it is to remember the name. One result of this is that totally new things are much harder to remember than things that fit into a system. Many MS specialists have patients who actually took a demotion or refused a promotion because of the difficulty of learning a new system even though they were outstanding in their work on a known system. There are also other problems with thinking and memory. When I am walking, I often think about things I have just heard, developing their relationship to known facts thus consolidating memories. If you have walking difficulty, you have to think about walking rather than what you will do next. A neurologist friend of mine, Dr. Herman Buschke devised a test called “Walking While Talking”. This is a “divided attention” or “multitasking” type of problem. A person does a timed walk for 20 feet and returns for a total distance of 40 feet. First he is simply walking. Next, he does it while reciting the alphabet or doing a more complex task such as reciting alternate letters in the alphabet. This has little effect on normal individuals but, if there is difficulty with walking or with balance, the walking speed is slower and may involve brief stopping. This test was designed for frail and impaired elderly but we see the same effect in people with MS. It is a form of “multi-tasking” and it has been shown in a number of physiological studies that even simple tasks require activation of more, often much more, of the cerebral cortex in people with moderate to advanced MS than in normal individuals. Why does MS cause these problems? First, when a normal pathway is interrupted as often happens in MS, the brain must find a way around the problem. This often involves the transmission of information by different and longer routes. This likely involves multiple connections through shorter pathways and this takes longer. Thus thought process and information processing is slowed. Concentration involves the brain ignoring other things. This is not as often thought, a passive process, it is an active process that actually can partially shut off auditory input. This is often impaired in MS and things that normally wouldn’t interfere with cognitive activities become a problem. Many years ago, i was visited by a couple from Australia who were visiting in the states and seeing a number of MS specialists. One of their problems was that the husband who had MS was always irritable and frequently upset and angry. If memory serves, they had three teenagers who were noisy and he usually spent his time in a chair in the living area which was open to the kitchen and the children were in and out, often playing loud music, talking and joking. I explained that this would be overwhelming to almost anyone but was particularly distressing to those with MS. I strongly recommended that he have a quiet room where he could read or watch TV. If one of the children wanted to talk to him they could go in and talk to him, but only one at a time. A year later I got a long distance call from one of the most grateful couples I can imagine. They had followed the advice and it had totally changed their relationship. In another instance, I had a patient who had performed extremely well in a quiet office but simply could not function at a busy counter in the front of the office because too much was going on simultaneously and she couldn’t manage the distractions. The cognitive problems in MS, unless very advanced, are not really a form of dementia but are composed of several different problems that arise in the process of compensating for the various deficits and damaged pathways that slow mental processing and interfere with normal brain function. Too much information can be confusion. Many people with MS become very uncomfortable in supermarkets, drugstores and malls. If you think about a supermarket, every item in it is vying for your attention. There is an enormous amount of information coming in, too much for the individual to process. As a result, many people give up shopping or limit it as much as they can. Cocktail parties and similar events are often a problem. Shutting out competing conversations is difficult for many of those with MS. This may result in sharp restriction in their social life and can lead to agoraphobia (fear of going out or of large groups). They often can function better in small intimate groups where there is only one conversation going on at a time. Understanding the nature and type of cognitive problems often allows for accommodation that will allow a person to continue in the work force. Normal fatigue – This is the fatigue that we all feel toward the end of the day. It is often worse in those with MS because of the extra effort that may be needed for accomplishing various tasks that may be more difficult in those with MS. It is responsive to rest and everyone has it to some degree. Fatigue due to depression – One aspect of depression is loss of energy. It is difficult to do anything when you are significantly depressed. Depressed people often sit around, unable to generate the energy to do anything. Half of those with MS will have significant depression at some time during the course of their disease. This can be aggravated by some of the medications that we use. Interferons can cause or aggravate depression and in a few instances, it is necessary to change medications to manage the depression. Fortunately we have an increasing number of disease modifying treatment options that do not induce depression. Handicap related fatigue – This is an exaggeration of normal fatigue caused by the extra effort expended to overcome a handicap. If you have a weak leg, it takes more effort to walk, if you have a clumsy hand, work with it requires a great deal more effort. If you are having memory or cognitive difficulty, mental tasks will require more effort and more concentration that can be very fatiguing. Disease process related fatigue – In the authors opinion, this is due to the chronic activation of the immune system. This can be a very profound generalized fatigue. It can be total exhaustion, like you feel when you have the flu and the immune system is activated to fight it except you don’t have the fever. It can be difficult to get out of bed. You can barely get up to go to the bathroom. Medications may help but better control of the MS is important because disease related fatigue is usually an indication that your disease is active even if you don’t have other symptoms of an attack. When very profound, a course of steroids may help. Nerve fiber fatigue – This is a fatigue that is specific to demyelination. After a certain amount of use, the demyelinated nerve fibers quit conducting and nothing you can do other than rest will fix it. The most commonly recognized form of nerve fiber fatigue is seen in walking where the individual may be able to walk a certain distance and the legs just quit. It is not painful but the muscles refuse to work. It take a lot more energy for a demyelinated nerve fiber to conduct and once the energy supply in the nerve is exhausted, rest is required for recovery. This can sometimes be seen with loss of vision in very bright light conditions. This fatigue is often exaggerated or caused by an increase in body temperature. Impaired Sleep – This is a very frequent and sometimes complex problem in MS. See section on sleep problems in MS. Medications induced fatigue and drowsiness – Many medications used to treat problems seen in MS can cause drowsiness. These include muscle relaxants such as baclofen (Lioresal®), tizanidine (Zanaflex®). Anxiolytic drugs used to treat anxiety are often sedative. Benzodiazepine drugs such as diazepam (Valium®) and clonazepam (Klonopin®) among others are somewhat sedative as are tricyclic antidepressants such as amitriptyline (Elavil®), nortriptyline and several others. There are many other medications that can cause drowsiness. If the drowsiness occurred soon after starting a new medication, check and see if has sedative effect. Management of fatigue can be difficult . First, it requires of a careful exploration of what is causing the fatigue and it is often multifaceted. One of the best treatments for disease related fatigue is counter intuitive but regular exercise usually will markedly improve disease process related fatigue. You have to begin slowly because if you overdo it, you will feel it for several days, begin easy and slowly build it up. In my practice, I have never had someone who exercised regularly who had significant disease related fatigue. Why this works I don’t know but it does. Modafanil and armodafanil (Provigil° and Nuvigil°) expensive but work in the vast majority of patients. These are not FDA approved so it can be difficult to get payers to pay for them. Amphetamines and methylphenidate (can be useful but their use is restricted and they are addictive). You should discuss your fatigue with your doctor and come up with a plan for its management. There are a variety of sleep problems that occur in MS. Some are directly related to MS and some would likely occur even without MS. The following is a list of some of the more common problems. Bladder dysfunction – You really cannot get a good night’s sleep if you have to get up 3 or 4 times because of urinary urgency. In addition to the usual bladder management methods (see section on bladder), vasopressin (Desmopressin®) is sometimes used to minimize urine production during the night. Patients should restrict fluid intake for 1-2 hours before bed and it is taken at bedtime. This has a disadvantage as you must get rid of the fluid in the morning to prevent edema. This may result in considerable urinary frequency in the morning but it is usually easier to deal with than the lack of sleep. Sleep apnea – This is particularly common in overweight and obese people, with or without MS. If you wake up gasping for breath or your partner notices that you stop breathing followed by a sudden deep breath while sleeping, you should suspect sleep apnea. Usually if sleep apnea is suspected, a sleep specialist is consulted and formal testing with polysomnography is done. Polysomnography is a test in which the person sleeps with electrodes that monitor EEG, respiration and heart rate and can tell the physician a lot about how well you sleep. It is often treated with use of a CPAP machine during sleep. CPAP stands for continuous positive airway pressure and prevents the airway from closing and shutting off the airway in people with sleep apnea. Narcolepsy – There appears to be an increased risk of narcolepsy in MS. In narcolepsy the individual falls asleep almost anytime. There are a number of distinctive features in narcolepsy in addition to falling asleep. These include cataplexy (a sudden weakness that occurs when surprised that can actually cause you to fall), hypnogogic and hypnopompic hallucinations (Hypnagogic or hypnopompic hallucinations are visual, tactile, auditory, or other sensory events, usually brief but occasionally prolonged, that occur at the transition from wakefulness to sleep (hypnagogic) or from sleep to wakefulness (hypnopompic). These can be so real that it is difficult to determine if it really happened or was a dream. Sleep paralysis where you wake up unable to move for a few minutes can also occur. Restless Leg Syndrome – This is a condition in which there is a persistent urge to move the legs at night, sometimes causing the person to get up and walk around. It is common in MS. It can be caused by anemia (low red blood cell count) particular in women. When caused by anemia, treatment of the anemia may help. MS can cause it in the absence of anemia. There are several treatments that help. These include dopamine agonists such as ropinirole (Requip®) and pramipexole (Mirapex®). Benzodiazepines, particular clonazepam (Klonopin®) may be helpful in some instances. Napping – napping during the day can interfere with sleep at night. This is not a common problem in those who are still working but can interfere with sleep at night, particularly if it is frequent during the day. Stimulants such as modafinil (Provigil®) and armodafinil (Nuvigil®) may be helpful for excessive daytime sleepiness. Remyelination is a very important part of the process of recovery from an MS exacerbation. When I was a resident, the dogma was the remyelination did not occur and demyelinated fibers did not conduct; however, Charcot had reported unequivocal evidence that they could conduct, the neurologists at that time apparently didn’t know their history. I spent much of my career working on the process of myelin regeneration and repair. Remyelination is often quite effective early in the disease but becomes less complete as the disease progresses but even then, what little occurs is very important. Most of the long term disability in MS is due to the loss of axons (nerve fibers) that occurs during demyelination. Dr. Bruce Trapp and co-workers at the Cleveland Clinic studies nerve fiber loss and found that, in a typical acute plaque, about 11,000 nerve fibers were interrupted per MM3 of acute plaque. Demyelinated nerve fibers can conduct nerve impulses but conduction is markedly slowed. When pulses are very close together in time, the second pulse often fails. Conduction is temperature sensitive so that when the body temperature rises, symptoms not normally present may recur due to failure of conduction. This can occur when working out in the heat, after a hot bath (A person with MS should never ever get in a hot tub alone, people have actually died because the heat made them too weak to get out of a hot tub by themselves). I have had patients who took a hot bath and had to run cold water to cool off before they had the strength to get out of the tub. A good example of the effect of temperature is Uhthoff’s phenomenon where a person who has had optic neuritis loses vision when exercising or is out in the heat. It is not an MS attack and will clear when the person cools off. The explanation of why this happens is fairly technical and requires an understanding of normal nerve conduction. Figure 1 A and B illustrate normal nerve conduction. The electrical charge inside of the nerve fiber is normally negative at about minus 70 millivolts (mv) and this charge differential is maintained by the sodium potassium pump such that there is a higher concentration of sodium outside the fiber and a higher concentration of potassium inside the fiber. There is a small leakage of the potassium out of the membrane which maintains this charge differential. Basically the difference in potassium concentration between the inside and outside of the axon is serves as a battery that stores the energy for nerve conduction. As the nerve impulse comes in from the left in A, it is a positive current that depolarizes the node of Ranvier. When the negative charge drops to about -30 mv., the sodium channels open allowing influx of the positively charged sodium ions and sending the current down to the next node where the process is repeated. This is a very fast moving process and myelinated nerve fibers can conduct at rates of up to 60 meters/second (about 180 ft./sec.). 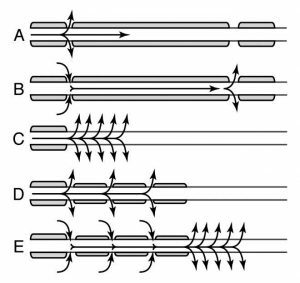 Demyelinated fibers generally conduct at 1-2 meters per second. At that conduction rate it would take 1-2 seconds for a message to get from your toe to your cortex. If remyelination is complete, the conduction rate and the efficiency of conduction approach normal and the following discussion of remyelination at the plaque margins does not apply. In figure 1C, the positive charge impulse reaches a demyelinated segment and is dispersed along the demyelinated portion of the nerve. Here we will need to go back to your high school physics and the function of capacitors. A capacitor is a device with two plates separated by an insulating dielectric substance. A charge on one side of the capacitor (fig. 2) induces a charge on the other side. The amount of charge induced is inversely proportional to the distance between the two plates. If you think of the nerve fiber as a circular capacitor and the axon membrane as the dielectric, you can see that, in the absence of myelin, the electric charge on the membrane will be much, much greater than with the myelinated fiber. (See Fig. 2). The result of the large capacitance of the demyelinated axon membrane (axolemma), a much larger current is needed to depolarize the membrane. (In the neurophysiological literature this difference is termed “impedance mismatch”.) In 1D we see the result of remyelination at the margin of a plaque. The segments of myelin are thinner than normal but also much shorter. The result is that several nodes are depolarized almost simultaneously (1D) leading to a much greater current (1E). This will be enough to depolarize the demyelinated fiber. This is necessary but not sufficient to initiate conduction in the demyelinated fiber. The other thing that must happen is new sodium channels need to be generated to populate the demyelinated segment which does not normally contain sodium channels which are restricted to the nodes in normal myelinated fibers. With that the repopulation and remyelination at the edge of the demyelinated area, the fiber can then conduct impulses. This remyelination occurs quite rapidly, often within 2-3 weeks. What are the consequences of this remyelination at the plaque margin? First, the demyelinated segment can now initiat impulses but transmission failure will often occur in rapid trains of impulses, the messages are late getting where they are going, are somewhat degraded and conduction is heat sensitive. During a normal nerve impulse in a myelinated fiber, there is a large safety margin for conduction. This safety margin is lost in demyelinated fibers. During an impulse, virtually 100% of the sodium channels open to let sodium flow in. However, the rate at which these channels close is temperature dependent. Even a single degree rise in temperature, will increase the rate of channel closure enough to limit sodium current and block conduction in many of the demyelinated fibers. This is what happens with a fever or anything that raises the body temperature. Cooling has the opposite effect and improves conduction in the demyelinated fibers by increasing the time the sodium channels are open. To illustrate how significant this can be, people with MS have died from hyperthermia because they became too weak to get out of a hot tub and there was no one present to help them. I once was called to see a patient in her own office who had MS and was developing the flu. She had come to work that morning and then developed a fever of about 103° and with it became so weak and ataxic she couldn’t stand. We gave her 2 Aspirin and sent her to the emergency room for admission. About an hour and a half later I got a call from the resident asking why I wanted to admit this patient who didn’t appear to be having any problem; however, her fever recurred before she reached the ward and the ward resident had no difficulty understanding the need for admission. Another consequence of this arrangement is that much more energy is required at the junction between myelinated and demyelinated segments is that much more sodium enters the nerve at each impulse and the pump that pumps the sodium out and potassium into the nerve fiber can’t keep up and conduction fails. This is often referred to as “nerve fiber fatigue”. When the difference between the sodium and potassium concentration inside the fiber approaches that outside the fiber the fiber will no longer conduct impulses. Clinically what we see is that as the disease progresses, patients who have trouble walking can walk shorter and shorter distances before their legs cease to work. A similar conduction failure can be seen when the myelin on the motor nerve roots is damaged by compression which also limits walking. This condition is known as “pseudo-claudication”. This is by analogy with walking limited by impaired circulation to the muscles where walking is limited by loss of energy due to oxygen deprivation which is painful and known as “intermittent claudication”. Conduction can be measured in a number of different pathways in the human nervous system. We measure if with evoked potential testing. You may have had a visual evoked potential test to measure conduction in the optic nerves. This is usually done by the use of a checkerboard image on a computer screen that keeps reversing. The effect of the changing impulses are averaged using electrodes over the occipital lobes and by doing this we can determine the average conduction velocity in the visual system. It is almost always slowed in anyone who has had optic neuritis. Similarly we can measure conduction through the spinal cord. By using a magnetic impulse device over the motor cortex and measuring the time to the induced muscle movement, we can measure evoked potentials in the motor system. In work done with Carol Pratt Ph.D. and Fay Horak Ph.D. we measured motor evoked potentials and sensory evoked potentials in MS patients with imbalance. Somewhat unexpectedly found that the imbalance is due to delays in sensory conduction. The brain treats the delayed sensory signals as valid signals and cannot adjust to the delay. Delays in the motor pathway did not cause imbalance because the brain knew what was happening and could correct for the poor and delayed motor response. The delayed position sense is the reason that a cane helps, it provides the brain with a better indicator of body sway over a much shorter pathway. It is also part of the reason why many patients will tell you that their balance is much better inside than outside (many say that they “have trouble on rough ground”). These patients become visually dependent for balance and objects close to them provide good targets where depth perception is effective. It is usually not very effective with objects more than 8-12 feet away. Incidentally, this is almost certainly the reason that dorsal column stimulators, which basically block position sense, were popular in the 1970’s. They fell out of favor and payers refused to pay for them because few people believed the results. Most believed it was a placebo effect. Our brains can deal with an absence of information much more easily than they can with false or distorted information and delayed information in the position sense system is false information because of the delay. Often where there are demyelinated fibers, they are in close contact with one another. When this happens, the electrical activity can spread from one fiber to many other fibers resulting in the simultaneous firing of an entire fiber bundle. This is what happens in trigeminal neuralgia (tic doloreux) and in tonic spasms. It can usually be controlled with carbamazepine (Tegretol®) or some other anti-seizure medication. In addition, ephaptic conduction can cause epileptic seizures and persons with MS are at increased risk for epilepsy. There are several ways of dealing with heat sensitivity. Cooling vests can be worn when going outside on hot days. These are vests with multiple pockets for freezer packs which will keep you cool, usually for an hour or more in the heat. Another way that one of my patients used is a cold swim. This works because the limbs are cooled and, the body reacts by vasoconstriction to maintain the core temperature. These limbs serve as heat sinks they delay the increase in body temperature in a warm environment. My patient said that the effect lasted for 3-4 hours after about 15 or 20 minutes in the cold water. The drug 4-aminopyridine (Ampyra®) is a potassium channel blocker that improves conduction in demyelinated fibers. It works by blocking potassium channels allowing a longer time for the sodium channels to induce depolarization before initiating and enhancing the ability of the impulse to initiate conduction in the demyelinated portion of the fiber.